This semester has been an interesting one for Yale-NUS College. From confusing art installations to a new President, there has been no shortage of events for students to keep up with. However, in a major investigation, The Octant has learnt that the recent events are linked together in a complex web of conspiracy involving the highest levels of the College Administration, current staff members, students, and possibly even a secretive global organization. The biggest clue to this conspiracy, however, is far from hidden; in fact, it could not be any more visible, being located right in the heart of the College campus. Our investigation therefore begins with a certain mural located in front of the Performance Hall: Wall Drawing #442. Was it right under our noses all this while? Wall Drawing #442 is described as a “geometrical combination of right angle and irregular triangles converging into an asymmetrical pyramid from three corners of the wall.” It was donated to the College during its inauguration ceremony on 12 August 2015, and funded by three members of the College’s Governing Board: Richard Levin, former Yale President; Linda K Lorimer, former Yale Vice President for Global and Strategic Initiatives; and Roland W Betts, former senior fellow of the Yale Corporation. Two things about the mural stand out: the use of triangles, which will prove to be vital later, and the number 442. “42” was easy enough to decipher: our well-read students at Yale-NUS will undoubtedly realize that this is a reference to Douglas Adams’ “The Hitchhiker’s Guide to the Galaxy,” where 42 is the “Answer to the Ultimate Question of Life, The Universe, and Everything.” (Even megacorporation Google agrees) This clearly marks the mural as a work representing great significance, or power. Does 4 represent a fourth college? On 1 September 2015, The Octant broke the news that the College was planning a fourth residential college (RC), to be built at “the North end [beside Cendana College].” It can hence be safely concluded that the number 4 refers to either the fourth RC, or all four RCs together. The fourth college is also expected to take four years to design and construct, further lending credence to our theory. As planning was supposed to begin in 2015, we can tentatively assume that the new RC will be ready in 2019. The signs are clear: something big is about to happen. Why Stop? So we can stop invading the President’s privacy! 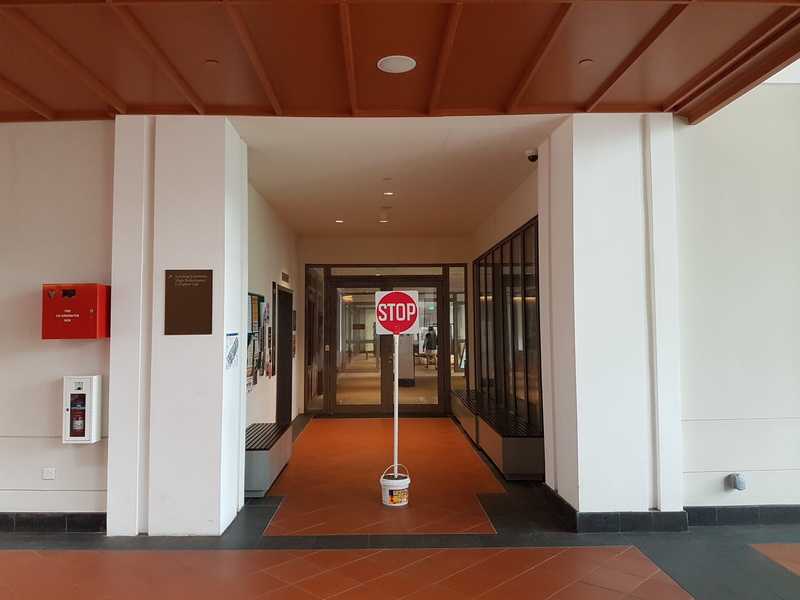 About two weeks prior to the publishing of this article, a STOP/GO sign was placed outside the main entrance of the College’s Library. This created some confusion among students, as there were no reasons given for its presence. Although the STOP/GO sign is facing the Library entrance, we believe that to be purely a distraction. The Library entrance, after all, is but one of the two entrances behind the STOP/GO sign. The other is an elevator, which happens to be the only way to access one area in particular: The President’s Suite. Art? Or cries for help? On the morning of 16 March 2017, not long after the STOP/GO sign was erected, students were greeted to the shock of several white sheets spray painted with messages, planted in several of the College’s lifts. Other than signs saying “This is an art installation,” there were no other clues to explain the purpose of the sheets. 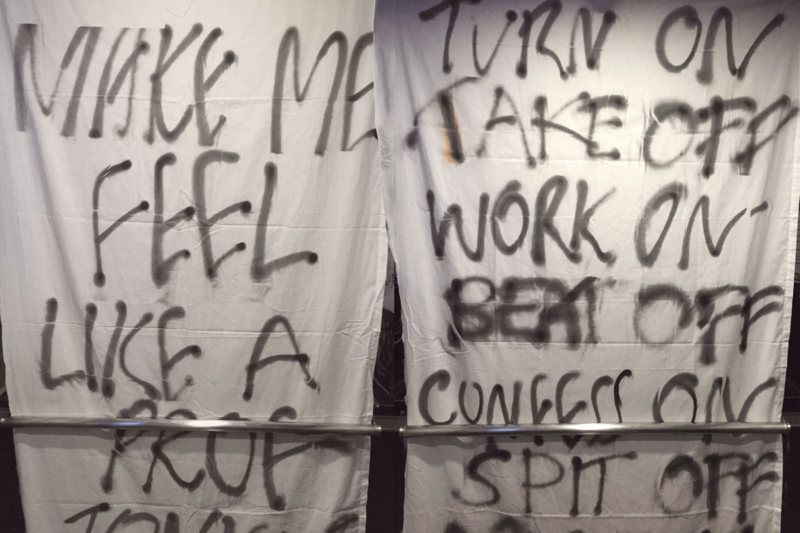 The sheets with spray painted messages were draped in lifts, immediately greeting anyone who walks in. Could these sheets be cries for help, possibly a desperate attempt by these hostage students to get the word out? Can froyo ever be free? Here, we need to sidetrack temporarily to another seemingly-innocuous activity: Saga College’s “Saga Eats” series. Starting last semester, Saga Eats are food events organized ostensibly to improve the welfare of hungry college students. These events have primarily centred around a particular dish: frozen yoghurt, or froyo for short. Through extensive research and gathering of sources, The Octant discovered that froyo is made up of milk fat, yogurt culture, flavourings, and (most worryingly) dihydrogen monoxide. Also known as hydroxyl acid, dihydrogen monoxide is the biggest component of acid rain. It is also used as an industrial solvent and coolant, as well as excised tumors of terminal cancer patients, among others. We now know that 1) the College is deliberately distributing dangerous chemicals in innocent-looking food products to its students, and 2) there are people, likely students, held hostage in the President’s Suite, probably as subjects of some biological experiment. We do not believe that it is a coincidence that the white sheets appeared in lifts of Saga, the same RC where the harmful froyo is being distributed. There is now clear evidence that points to a nefarious experiment that the College is performing on select students who have consumed said froyo. On 14 March 2017, the Governing Board of Yale-NUS College announced that current Executive Vice-President (Academic Affairs) Tan Tai Yong would be the College’s new President, replacing Mr. Pericles Lewis in July 2017. As he would soon become the new resident of the President’s Suite, The Octant took keen interest in Mr Tan, given the events highlighted above. However, it was not initially clear how he fit into the puzzle; Mr Tan was well-received by the student body, and he has not generated controversy in during his term at the College. In a breakthrough discovery, we finally realized that just like Wall Painting #442, the truth was hiding in plain sight: it was all in his name. Tan, as any Mathematics, Computational and Statistical (MCS) major will tell you, is short for the function called “tangent”. When is the tangent function used? Triangles. 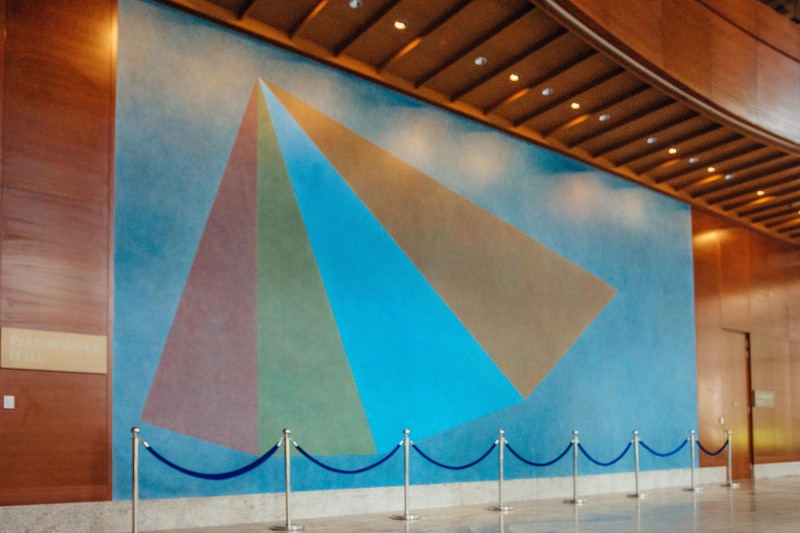 And as we know, triangles are the main component of the Wall Painting #442, representing the four RCs that will be ready by 2019 or beyond, during Mr Tan’s term as President. 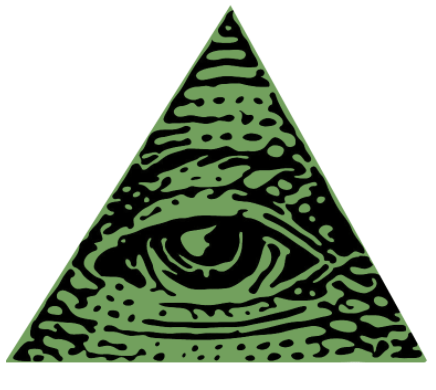 What else has triangles? Our new mascot, the Halcyon! We do not know the specifics of the goings-on in the President’s Suite. What we do know is that the College Administration is likely to be in active collusion with the Illuminati, possibly in a biological experiment of unknown motives, much to the detriment of our students. We also believe that with Mr Tan soon to become President, this last piece of the puzzle will be filled, and their plan (whatever it may be) will be complete. We can safely assume that the reason there is a culture of busyness in Yale-NUS is because the Administration wants to keep our attention away from the real issues. This also explains the extreme levels of apathy towards the Student Government. This cannot continue. Remember, your friends are important. As one of the voices of the Yale-NUS community, we urge an immediate investigation by local authorities into these worrying developments. We sincerely hope that you will join us in demanding that the College Administration halt all nefarious activities, and reveal the truth as soon as possible. The hanky panky must stop here.